Lean manufacturing facilities use a variety of tools and strategies to maximize efficiency and eliminate waste. Unlike strict process improvement methodologies, Lean is more of a high-level strategy or concept that will take advantage of what other systems have to offer. 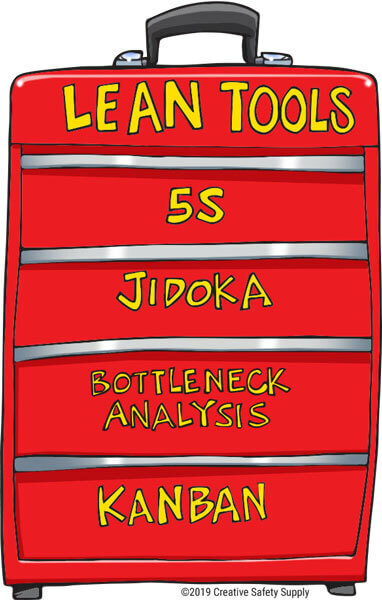 Part of Lean manufacturing is being able to determine which tools are the right options for a given situation. The following are some of the most popular Lean manufacturing tools available today. Sort – eliminating any mess or clutter in the workplace by removing anything that isn’t necessary for a given job. Straighten – Make sure all remaining items in the area have an assigned place where it is stored. Shine – Keeping an area clean of dust, debris, and other messes that can cause problems. Standardize – Follow standardized procedures across all shifts in all locations to ensure maximum efficiency. Sustain – Put in processes to ensure the other 4 S’s are followed at all times and aren’t just a one-time project. Jidoka is a concept that combines the benefits of automation with the requirements of human intervention. A simple explanation of this would be to have one person watching a production line. As soon as any defect is discovered by the person, they will shut down the entire line to not only fix the defect, but also identify the cause of the defect and take steps to ensure that it doesn’t happen again. This tool often seems like it would cause waste in the form of lots of work stoppages, but when done right, that is not the case. Each work stoppage will be an opportunity to identify a problem and put in a fix, which will make it less likely that the same defect occurs again. Over time, the number of defects causing work stoppages should drop dramatically. Conducting a bottleneck analysis will help a Lean manufacturing facility to identify where work slows down, or where limitations on production exist. By finding the ‘weakest link’ in the process, a facility can invest in expanding or improving specific areas to eliminate waiting time and other forms of waste. Kanban is a method of managing the flow of parts and processes within a facility to meet the needs of outside suppliers and customers. As a customer needs a particular product, the facility will ‘pull’ the needed parts from suppliers and have them pulled through the entire production system. This will help to reduce overproduction of products and help ensure maximum efficiency. There are, of course, many other Lean manufacturing tools that can be used. Over time, those who are implementing Lean manufacturing systems will learn of more and more tools to help continue to drive continuous improvement and waste reduction.